Here you will find all our latest shock conversion kits for the TRX450R. All our kits are 100% satisfaction guaranteed! We will not have one unhappy customer! All our kits are designed and fully tested before anything is released to the public. We take OEM shocks and design our kits to get maximum travel and performance out of stock components. If you have any questions about any of our OEM conversions please email our Technical Department. New DeRisi Racing linkage with bearings and seals. Front Shocks are modified for up to 2″ more wheel travel, and new multi-stage valving circuits to fit MX style Riding/Racing. The new rear linkage changes the leverage ratio curve. It takes out the kicking problem while adding more rear wheel travel. Front Shocks are modified for up to 2″ more wheel travel, and new multi-stage valving circuits to fit XC/Desert style Riding/Racing. 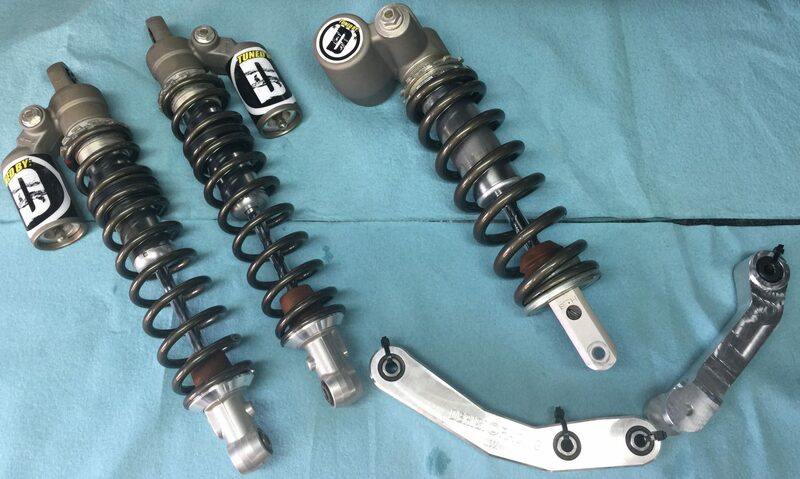 Rear shock is also modified with multi-stage valving circuits to fit XC/Desert style Riding/Racing. The new rear linkage changes the leverage ratio curve to take out the kicking problem while adding more rear wheel travel. Front Shocks are modified for up to 2″ more wheel travel, and new multi-stage valving circuits to fit Dune style Riding . All set-ups are 100% guaranteed!